Posted By:Unknown | At:9:04 AM Be the first to comment! After reading this article I now understand why so many of my friends were not happy with the movie. They said the acting was phenomenal, but the story was very disjointed and not worthy of the Godfather of Soul. There were several meetings. Eight white men and two white women. Was this a meeting of the Mormon Glee Club? The New White Citizens Council? Perhaps a Klan meeting? No. That meeting was the creative team for the new James Brown movie, "Get On Up." Welcome to post-racial Hollywood where if you host a fundraiser for Barack Obama, you're freed of the burden of hiring black writers. And where a rich white producer can jokingly declare, "I'm black." 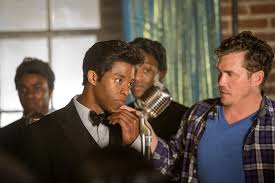 Indeed, all the producers, writers, and the director of the James Brown movie are white. No black people were hired until a few weeks before the cameras started rolling, the actors. In fact, several of the people involved in this whitewash are British. The Brits have a fetish for black projects. This is the Donald Sterling message: don't bring them to the game. There are over fifty black iconic biopics and black-themed movies in development in Hollywood, including multiple Richard Pryor projects, five Martin Luther King projects, multiple Marvin Gaye projects, and civil rights projects, and only one or two have an African American writer. Our entire history has been given over to white writers. When the late David Wolper was producing "Roots" thirty-something years ago, he hired no black writers. When asked why, he was quoted as saying: "They're too close to the material." I guess we're still too close. This Hollywood apartheid against the African American writer could be understood if the writers being hired were of such quality as to be beyond reproach artistically. With rare exception, that is not the case. Sift through the morass, and you'll find a group of hacks, insiders, and drinking buddies. The executives are trading our icons around like baseball cards. How do these insiders, pals of the executives, become experts on black culture overnight? Wikipedia. In case you didn't know, the entire black experience is on Wikipedia. Here is a typical day in Hollywood. Agent calls a writer, tells him he got him an interview for "this black guy who was really important." The writer says cool, goes to the wiki pages, memorizes them, takes the meeting and wings his "knowledge" of the black icon. That's it. He gets the job. You see, the first thing people do in this town before hiring someone is look in the mirror. What I see in front of me is beauty, brains, and competence, Oh, and hipness. Yep, that's who I'm gonna hire: me! If ever a project required black creative involvement, it was this one. James Brown was the blackest entertainer in the history of America. The blackest. There was nothing integrationist about his art, at all. He never tried to crossover. You had to come to him. He was iconic and not just musically. And yet, where did producer Brian Grazer hire to embody this blackest of black men? Three white writers, two of them from England. Then more producers were added, all white, and a white director, who has said that he sees this as a movie about singing and dancing. Bingo. Now we're ready to make a black movie. It doesn't matter a bit that one of the producers is a famous rock star who played with Brown a few times and lifted some of his moves. James Brown belongs to us, the black masses, and for us to be excluded from the creative team that made this movie is an obscenity. I'm aware that Spike Lee was involved briefly, but the finished product looks like a Mitt Romney family reunion. Let me tell you who James Brown was, really, not the Wikipedia James Brown. He was a civil rights icon. Put James in the pantheon of the most impactful black men of the 20th century, and he would not be out of place. How can I make such an assertion? One song: "I'm Black and I'm Proud." Did you watch the movie? If yes, what did you think?